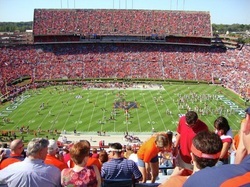 Jordan Hare Stadium Features: Jordan Hare features a full lower bowl, the student section is located in the south end zone of the lower bowl. The east and west upper decks were eventually added to the stadium in the 80s and the stadium has a capacity over 80,000. Every time I've attended a game I've sat in the upper deck. Which offers a great view of the game and the bands formations. There have been a few upgrades to the outside of the stadium, as well as a new HD scoreboard in the end zone inside the stadium,great for checking out replays. The concourse doesn't bring much excitement. War Eagle is a legend, there are four different myths about war eagle but you can pick the one you want to believe. It's also a way to greet fellow Auburn fans. Tailgating starts early in Auburn and by early i mean a few days before a game. The city of Auburn is primarily a collge town. Auburn has a population of 60,000 but, on game days the population can rise to over 160,000. The city isn't very big but there is a few locations that you should stop by and check out. 1.Toomers drug is your first stop before the game, many fans love the lemonade for me it’s the vanilla milkshake. 2.If you’re looking for some auburn merchandise you'll find a few bookstores downtown and there is also the official bookstore on campus. I would suggest the one on campus its not as packed, bigger and has a great selection of Under Armor apparel. 3. Make sure you head to the tiger walk,(3rd picture) where the fans come together to watch their auburn tigers walk into the stadium. Get there early for the best view.